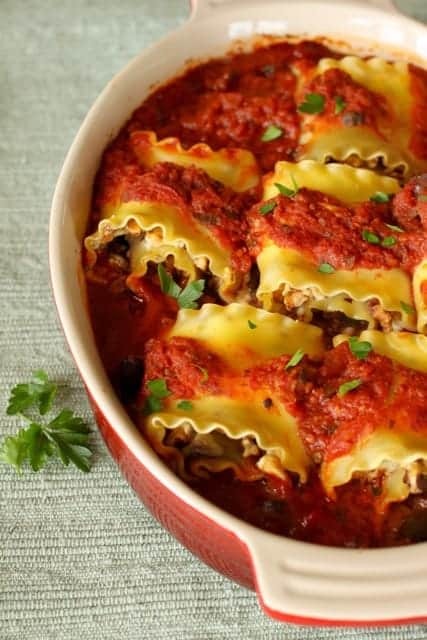 Walnut Mushroom Lasagna Rolls are a satisfying solution for a meatless meal with foods that deliver healthy dividends. A vegetarian recipe, this is a fresh spin on a classic recipe, that’s good enough for company and easy to make ahead. Her words surprised me, moved me and have haunted me ever since. I felt such compassion toward her that she thought she needed my permission, a stranger, a speaker on a stage, to enjoy eating. Since then my passion has only grown about taking the confusion out of healthy eating. That’s one of the main reasons I started this blog. There is so much “noise” about healthy eating and how to do it. We all make food choices, but we’re typically not taught how to do it well. Most people will never see a registered dietitian, but many are hungry for solid nutrition and health advice. I want to help people optimize their performance with realistic nutrition solutions. 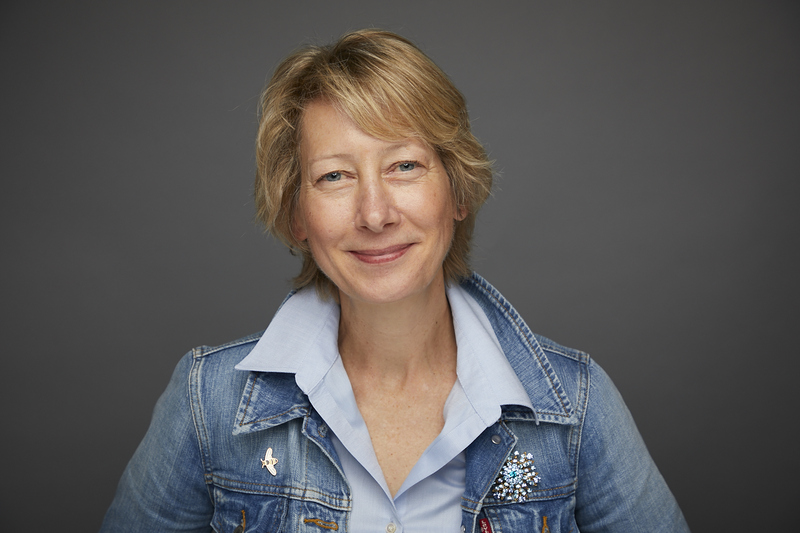 I want readers to know food can be delicious and healthful — all on the same fork. I want to take the fear out of eating. I’m certain most of us don’t need another chocolate cake recipe. We’re just looking for solutions about what to cook for dinner. The recipes I create use the foods I eat…foods that deliver great taste and are satisfying and nutritious. 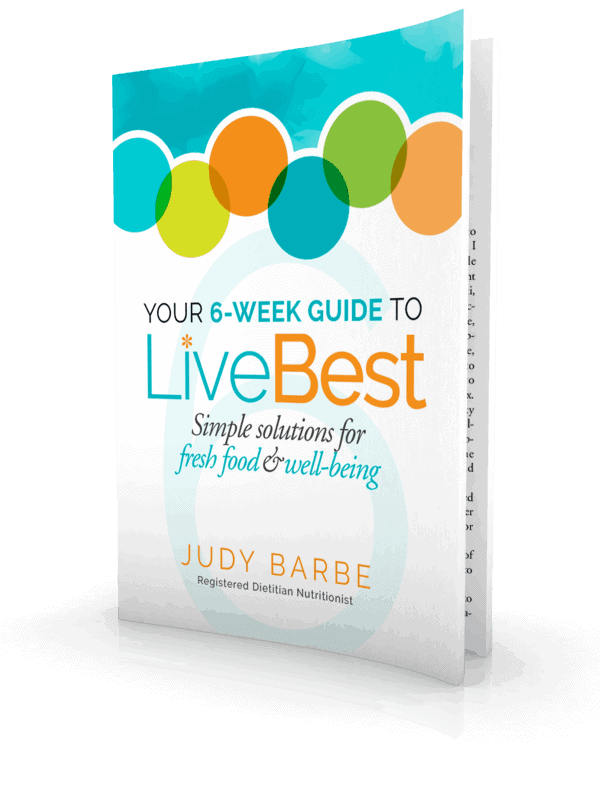 Foods that help me – and you – LiveBest. It’s a satisfying solution for a meatless meal. Vegetarians, grab your forks! Not a vegetarian? No problem. I’m pretty sure you’ll like this plant-based, comfort food recipe. It’s a fun spin on a traditional recipe. Walnuts, which are rich in healthy fats, protein and fiber. Walnuts are unique because they are one of the highest plant-based sources of the essential omega-3 alpha-linolenic acid (ALA). Mushrooms add a rich, savory flavor plus deliver valuable vitamins and minerals. Ricotta cheese, a protein-packed, calcium-rich cheese that plays well with others. Tomato sauce, which helps fight cancer and keeps arteries strong. Fill a food storage bag with the ricotta filling. 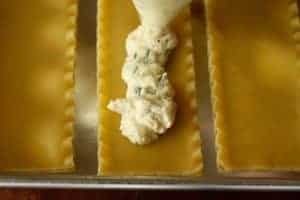 Clip off a corner of the bag and squeeze the filling onto the lasagna noodles. Layer the mushrooms and walnuts over the cheese. Roll ’em up. 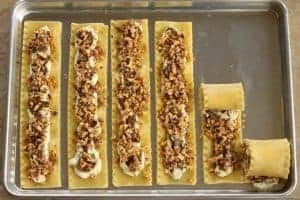 Here’s the baking sheet I use for Walnut Mushroom Lasagna rolls, cookies, nut toasting and vegetable roasting. Spoon marinara sauce in bottom of pan (this is the marinara sauce I use). Nestle the rolls in the sauce and spoon a little more sauce over top before baking. This is the baking dish I use. I grew up in central California, home to lots of walnut groves. I’ve been eating walnuts for as long as I can remember. In fact, my mom used to keep my sister and I busy shelling walnuts. We’d spread newspapers on the patio, sitting cross-legged, each of us tapping walnuts with a hammer to crack the shell and release the nuts. Not sure how many walnuts made it into the kitchen, but my sister and I prefer to buy them shelled these days! I cook with all the foods in this recipe. Check out how I use these ingredients in other recipes! Note: This post contains affiliate links, which means if you click through and buy something, I recover a small commission. It does not increase the price you pay, but does help fund this blog and website. 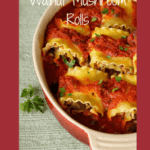 Walnut Mushroom Lasagna Rolls are a satisfying solution for a meatless meal with foods that deliver healthy dividends. A fresh spin on a classic recipe, that’s good enough for company and easy to make ahead. To prepare mushrooms: Melt butter and oil in a large skillet, over medium heat. Add mushrooms, garlic,salt and red chile flakes. Stir occasionally, cooking 10 –12 minutes, until mushrooms are softened and browned. Set aside to cool. Lay lasagna noodles out flat. Squeeze cheese mixture down center of each lasagna strip. Layer mushrooms over cheese. Sprinkle walnuts over mushrooms. Roll up noodles. Use a gentle touch so cheese doesn’t ooze out of noodle. Place seam-side down in baking dish. Top with remaining sauce. Bake 35-45 minutes, until heated through. I love making lasgana rolls but never have added mushrooms or walnuts – doing that next time for sure!